Moving drums of chemicals about the workplace in complete safety is child’s play with our robust Poly Dolly. Designed to carry one or two drums, our dollies have integral spillage containment and straps to keep the drums securely in place when they’re on the move. Click to view our full range of Spill Containment products. Replacement double looped strap for Poly-Dolly. Fits a Poly-Dolly including a 205 litre drum. 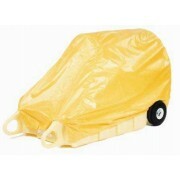 Reinforced High Density Polyethylene Fabric (HDPE) tarps are made with elasticated bottom and adjustable straps. UV-inhibitors resist the effects of weathering. Attached document pouch for holding chemical information and other documents. Tough polyethylene construction, cannot rust or corrode. Integral moulded rolled-grip handle for extra strength and easy lifting. 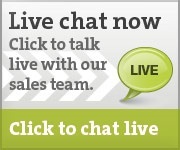 Transports and dispenses 205 litre drums. 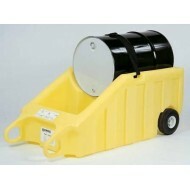 Multipurpose Poly-Spillcart is ideal manual transportation for drums, buckets, batteries and engines. 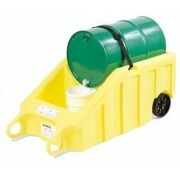 Eliminates the risk of spills during transport with a large sump capacity. Ergonomic handle and castor wheels ensure free movement on the Poly-Spillcart.